A century from opener Matt Thompson put Devon in a strong position at the end of the first day in their Minor Counties match with Herefordshire. The 18-year-old hit 122 as Devon finished their innings on 343 all out after 90 overs. 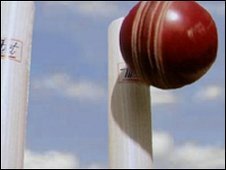 There were also half-centuries for Ian Bishop  and Sandy Allen , while Herefordshire's Charlie Griffiths took 6-77 with the ball. Herefordshire were 156-2 at the close, with Steve Adshead on 108 not out.